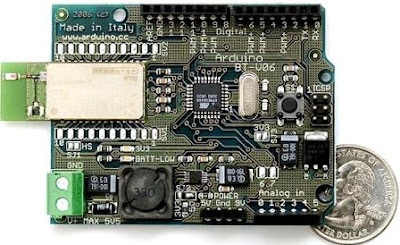 The Arduino BT is a microcontroller board originally was based on the ATmega168, but now is supplied with the 328. (datasheet) and the Bluegiga WT11 bluetooth module (details and datasheet [pdf]). It supports wireless serial communication over bluetooth (but is not compatible with Bluetooth headsets or other audio devices). It has 14 digital input/output pins (of which 6 can be used as PWM outputs and one can be used to reset the WT11 module), 6 analog inputs, a 16 MHz crystal oscillator, screw terminals for power, an ICSP header, and a reset button. 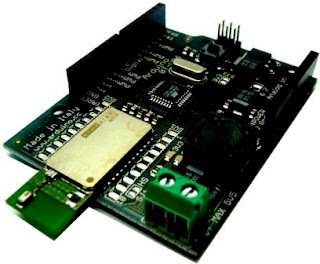 It contains everything needed to support the microcontroller and can be programmed wirelessly over the Bluetooth connection. The Arduino BT can be powered via the V+ and GND screw terminals. The board contains a DC-DC convector that allows it to be powered with as little as 1.2V, but a maximum of 5.5V. Higher voltages or reversed polarity in the power supply can damage or destroy the board. 9V. The input voltage to the Arduino board (i.e. the same as the V+ screw terminal). You can supply voltage through this pin, or, if supplying voltage via the screw terminals, access it through this pin. Warning: despite the label, do not attach 9V to this pin. It will damage the board. The Arduino BT can be programmed with the Arduino software (download). You can also bypass the bootloader and program the ATmega328 through the ICSP (In-Circuit Serial Programming) header.